You can suppose that T200 is a next model after T100 and that they even have the same platform. It's logical if to follow models names. But in reality it happens otherwise, T200 has many features of the other model, namely S100. In addition to standard features, T200 has some peculiarities, for example, an autoopen folder. Let's turn to the phone construction. T200 is produced in silver colour. Phone dimensions are 88.5х46.5х22.8 mm, weight is 99g. These features are similar to S100. The phone is rather large but it's handy. Despite similar dimensions there are slight differences in the phone design. 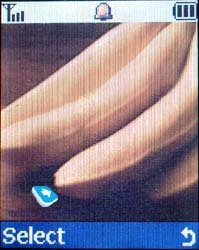 For example, center of front cover is made as an insertion and it has another color hue. If you look at the left-hand side of the phone, you don't find any differences, they are absolutely alike: IR-port and double volume key are placed there. A portable handsfree connector is located on the upper side, it is covered by a rubber cap. A system connector is positioned on the bottom of the phone. A loudspeaker, which is situated on the rear part of the phone, differs greatly. Now the phone has a loud ring signal, what seemed to be unreal for a 16-tones polyphony. 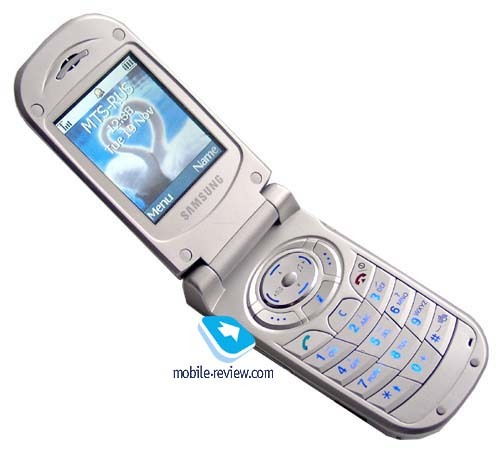 I can say that Samsung held a new standard in this field. Ringing tones are really very nice and loud; they are beyond comparison. Another difference of T200 is absence of call light indicator. A key to open the phone is placed on the right-hand side. If you hold it 2 seconds, the phone will open automatically. If you strongly press an upper cover, the phone won't open. A mechanism consumes minimal energy, it doesn't have enough power to meet resistance, only to open and close the phone. A phone autonomy reduces by 10-15% if to use an autoopen folder. There are 5 pre-defined tones which can sound while opening or closing, but you can turn them off if you don't like them. By the way, you can open and close the phone as usual and not use special mechanism. To say the truth, autoopen folder is just a pleasant extra feature. Sometimes it's quicker to open the phone with hands than to use this gadget. On the other hand, T-series are fashion phones and it's a wonderful extra feature in T200. Everybody surprised greatly when saw how my phone opened. Fashion phones are produced to force people to pay attention to the phone owner. Some features like this one or hush colours allow to do it. A mechanism of the folder worked really well. It jammed only once (the phone quickly began to open folder and closed it again) but it was my fault. We replaced the battery and it started working. Then we tried artificially simulate this situation but we failed to repeat it. A mechanism worked duly. Pay attention to the battery charge level in this phone. The last point disappears quicker than two first ones. A folder doesn't open automatically when the battery is run out. You should charge the phone as quick as possible, otherwise, it will turn off during 1-2 hours. Two batteries are included in the standard kit: normal (Li-Ion, 900 mAh) and slim (Li-Ion, 720 mAh). According to the manufacturer, the phone can work up to 8 hours in the talking mode and up to 180 hours in the standby mode. Figures are again similar to S100. Out practice tests showed that the phone worked 3 days in case of 40 minutes of talking (Beeline Network) and 1.5 hour of using other applications. So, autonomy is really almost the same as S100 has, though T100 is equipped by auto open folder, which consumes more energy. Perhaps it is a result of software optimization, besides, another kind of internal display is used here, UFB instead of STN. UFB (Ultra Fine Bright) is a next technology after STN, it has better screen brightness and color rendition. 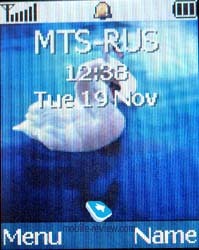 Up to 7 text lines (16 characters each), a service line and tips to soft keys use can be displayed on the internal screen, which has a resolution of 128х160 pixels. 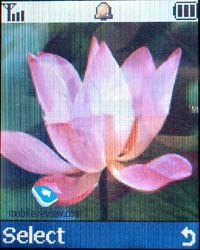 A display can show up to 65000 colours. 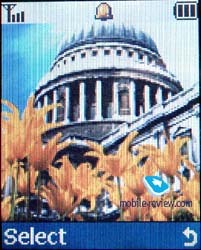 It seems to us that the picture on T200 screen is better than on S100 screen, but it loses to TFT displays. The information is not highly visible in sunny days. Such information as time, date, battery charge level and signal strength is displayed on the external screen. It has a resolution of 96x64 pixels and a blue backlighting. 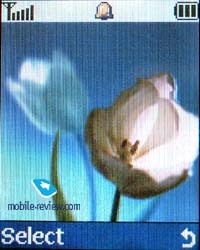 When the backlighting is switched off, a screen is merged by green, what resembles holographic displays from Motorola. 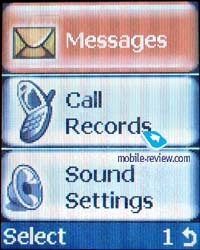 A keypad is positioned on the lower part of the phone. A 4-directional navigation key is placed under the screen, soft keys are situated around. All the keys are made of plastic, they are well-spaced and easily to type. There are several small rubber insertions on the lower part of the phone to protect the screen from the keypad and vice versa. We'd like to pay attention that despite a great similarity of S100 and T200, the latter one doesn't have some functions. It is a dual-band phone and it doesn't support Java. This lack can be explained by marketing policy to avoid rivalry. A menu structure is traditional. A main menu is looked like a list of items with animated icons, and all submenus are also represented as lists of items. Since the screen not always contains full titles of the menu items, they are automatically scrolled. All items are numbered to navigate with shortcut numbers. A main menu can be represented in two ways: either as icons or as folders. There is a possibility to change a menu design, you can change colours of the titles and background (up to 5 variants). A navigation key is used to access quickly such applications as to-do list, organizer, messages and melodies. Let me describe the main features of the phone. Phonebook. You can store up to 500 phone numbers in the phonebook. Up to 3 numbers (home, office and mobile) and e-mail address can be added to one entry. When you create a new contact, you are offered, firstly, to choose a phone number type and then to enter it. Auxiliary numbers can be entered from the edit submenu, not at once. Such arrangement has both advantages and disadvantages. It depends on how often you enter contacts, which have only one phone number..
You can organize your contacts in caller groups. A special ringing tone and a special icon can be associated with each group. 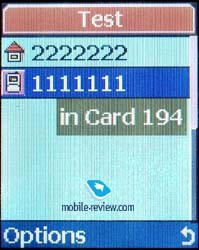 In the phone list all numbers (from the phone memory and SIM-card memory) are displayed. The handset provides a find option by name. You can just type a first letter and a first name matching your input will be displayed, then you can type the next letter and so on. A similar find option exists in every caller group. You can setup a speed dialing for up to 8 phone numbers. Unfortunately, though it's a little bit strange, there is no voice dialing in this phone. Messages. It's possible to keep up to 20 messages in the phone memory. This model supports EMS standard. So, the handset has a good set of icons, melodies, sounds and animation. A rather unusual set of smiles is also placed here. Funny faces have now a body. Other features are standard: a predictive text input T9 for English and a possibility to create up to 5 own templates. Call records. Traditionally, lists with last 20 received, 20 dialed and 20 missed calls are under this menu. You can view a date and a time for each call. A peculiarity of the phone is that the same numbers are not doubled in the list, a phone number moves up and a new time and date are indicated. It is the most convenient structure for the majority of users. Tone. You can set various ringing tones to personalize your phone: one of the 6 bells, one of the 8 animals voices (horse, dog, birds and so on), one of the 31 melodies. Melodies are different - modern and classical, they can satisfy all needs. I think you will be delighted by them, taking into consideration that the phone has polyphonic melodies and a loud sound. Settings. Here you can personalize your phone and adjust almost all settings: change a menu language or set a screensaver (there are 5 pre-default animated pictures). These screensavers are simple animated clips in fact. Several pleasant pictures, united by one theme, constantly change on the screen. In this menu you can also adjust screen contrast and find security settings. Organiser. Several applications are placed under this submenu. The first one is the calendar. You can add one event for each day, to add more you should copy a note of the other day, it's not handy. 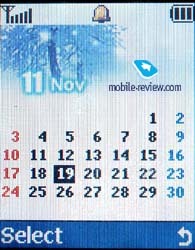 Here you can also view a calendar by month. Days with events are highlighted and you can quickly move to the date you selected. A to-do list supplements possibilities of the calendar. This submenu allows you to write a job list, set a priority type (high, low, normal). Notes can be copied to the calendar. Time and date. Here you can setup time and date and check the current time in many cities (a world time feature). Alarm-clock. You can set alarm to ring at a specific time (once, daily or weekly (from Monday till Friday or from Monday till Saturday). There is also a calculator and a convert currency in the phone. Network Service. All settings concerning operator services are placed here. Funbox. This submenu enables you to access a WAP-browser (version 1.2.1). There are also three preloaded games here: two arcades (in the air and in space) and one Tamgotchi. The latter is not very interesting, rather monotonous. 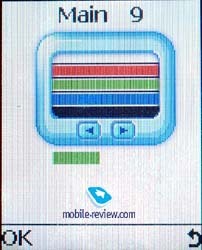 There is also an item where all files, which can be downloaded to the phone (animation, pictures and melodies) are kept. You can use a cable and a software, which are included in the standards kit, to download applications. Sound quality, and signal strength are comparable to any phone from Samsung and similar to S100. Ringer is louder here, it can be heard everywhere. Vibrating alert is average. On the one hand, T200 is simpler than S100 (no Java, dual-band), on the other, it is more complicated (autoopen folder, UFB display). In the whole these two models are comparable if to take into account an approximate price of 450-400 USD. Choose that one which is closer namely for you. 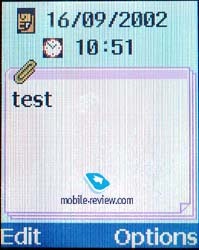 If you don't need Java and the third band, take T200, which has the same functions, better display and an autoopen folder. We think that it is a product of high quality, we didn't have any problems either with software or with hardware while using the phone.